Curry patta or curry leaves are not something that makes curry powder as a westerner would know. 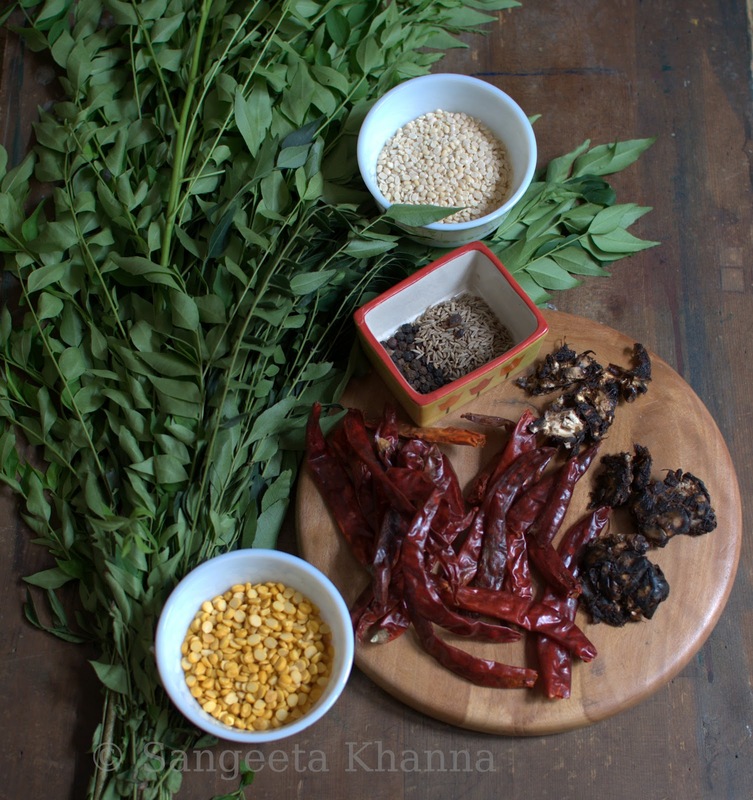 Curry patta or Karipatta is an aromatic herb that grows on a tree, with immense medicinal value apart from a wonderful taste it imparts in curry or daal tempering. 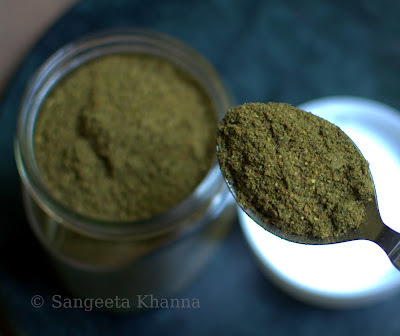 This curry patta powder or karuveppilai podi is a condiment that can be used to make lentil soups, as a seasoning to buttermilk or anything you can think of with it. I have been suggesting this powder to my friends for so long that almost all of them use it now. The most common use being mixed with the daily buttermilk or raita. I use it for my red lentil soups too. Actually made the soup today for dinner in a different way and am going to share that recipe as well in this post. Recipe alert : you need a lot of curry patta to begin with. Almost a whole branch of a handsome tree. Recipe highlight : the fact that it uses a lot of curry patta, this condiment is actually a nutrient supplement. Learn more about curry patta nutrients here and here. Heat the oil in a thick base kadhai, I used my desi Cast iron kadhai. Tip in the asafoetida and chopped tamarind first and fry it for a few seconds to dehydrate it, keeping the flame low. Add the lentils, scissor cut red chillies, cumin and black pepper in that order one by one, stirring the mixture all this while. Let the lentils turn pinkish brown before adding the curry patta, all of them together. You can add a few more spices like cardamoms and cloves if you wish. Keep stirring the mixture slowly on low flame till the curry patta look shrunk and a bit crisp. Cool the mixture completely and grind it in the spice grinder of your food processor. A fine or coarse powder as per your liking, adding salt while powdering it. And now using this wonderfully flavorful powder for my lentil soup. I had seen a recipe of an instant lentil rasam and was intrigued by the ease of making. I am a sucker of ready powders and pastes and lentil paste looks really easy to do.Two kinds of lentils soaked just before an hour of dinnertime and processed within 10 minutes. And that was all preparation I did for my dinner today. On the right side bowl is the red lentil soup that was just boiled in a pan for about 10 minutes. No tempering and no complex procedures, just the red lentil paste (4 tbsp total paste) and 2 tbsp of this curry patta powder was mixed with a liter of water and boiled slowly while stirring it in between. A little salt to taste. Left side bowl is a coconut and raw curry patta chutney with some garlic and a red chilly. Those small fritters are the Urad daal paste blended with ginger and cumin seeds, salt to taste and a little black pepper powder. Some chopped curry patta added and fried in hot oil on medium flame. It does not soak much oil and makes very soft fritters. 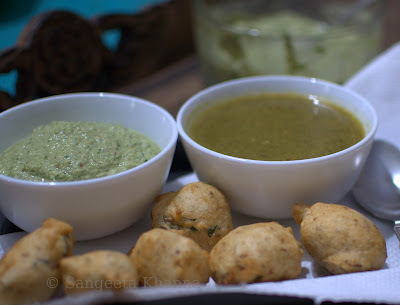 The trick to make vadas or fritters that does not soak much oil while frying is, keeping the batter thick and making smooth edged vadas or fritters. Keeping the flame medium helps even cooking in the middle. The Vadas do swell up while frying, almost doubling in volume. This is achieved by blending the lentil paste in the food processor till it becomes lighter, incorporating some air. When are you making this curry patta powder? i do a similar thing with fresh coriander and pudina too... comes in very handy for a simple hot meal with rice and ghee! this looks interesting...i can replace this with curry patta in any recipe requiring it right??? if it is so..then im making it asap..coz my pain is that i dont have a curry patta plant and always at a loss when i want to make dishes with curry patta as an ingredient and find that im only lacking in that, and have all other ingredients!!! I don't think this powder would come handy with something like Upma, but for liquid soupy recipes it can be added instead of curry patta. 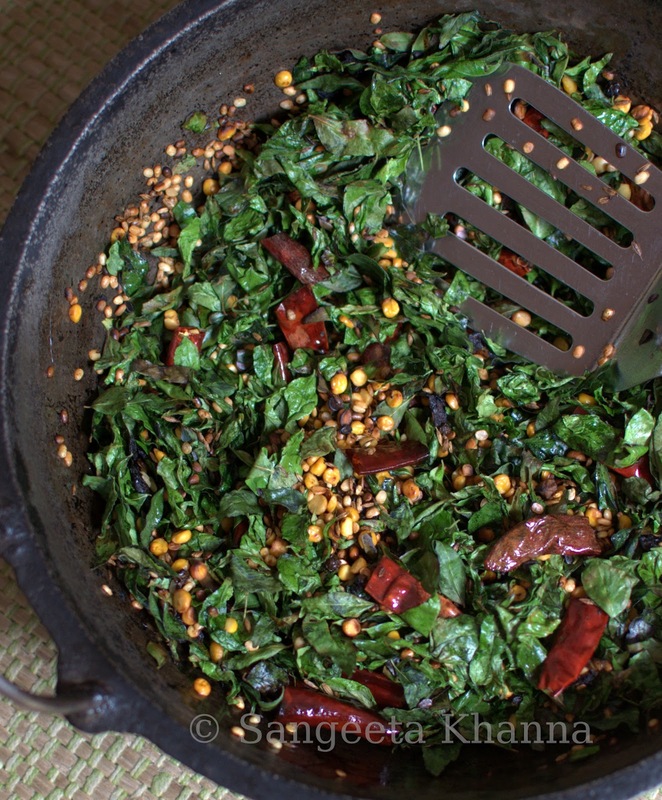 Curry leaves in the tempering give a different aroma and flavor to the recipe Sushmita. 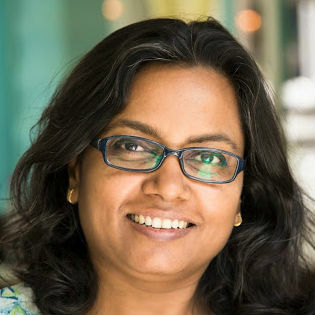 Hey Sangeeta, I am also big time into ready powders,pastes and lentil pastes, all these to me come real handyin in my cooking, will make this asap :)! I know your Naani's curry patta powder is tastier than this. Would you give me a little bit of that? 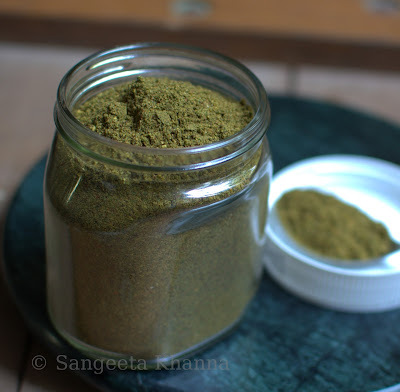 I make this powder with curry leaves dried in the shade instead of sauteing and roasting them. Wash and dry the leaves in shade and then use with the other ingredients. Only I cut out the red chillies almost completely (just add a couple of them for flavour) substituting with pepper. We make something called molagu kuzhambu, which is made with fresh ground paste of the ingredients used for this, leaving out the chana dal. But we can make the powder for an instant mix of the kuzhambu too. All you have to do it to dissolve a couple of tbsps of the powder and boil it well. A tadka of mustard and hing in a little ghee makes it a yummy mix for rice or as accompaniment with dosa. Try it! awesome meal. i know about curry leaves health benefits and mostly use the fresh or home dried ones in dals or sabzis. in fact my sis make curry patta powder and has been after me to make it. just that i am acting lazy. so now after seeing your post i plan to make this soon.